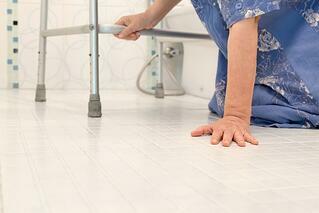 Among older adults, falling is a serious concern. According to the Centers for Disease Control and Prevention (CDC), falls are the leading cause of both fatal and nonfatal injuries for older Americans and, after a certain age, falling can be a virtual death sentence. With so much at risk, any condition that is both prominent among the elderly and linked to a risk for falls deserves serious attention. Overactive Bladder (OAB) is one such condition, and a recent research study is establishing a firm link between receiving treatment for OAB symptoms and a reduction in the number of falls among people suffering from the condition. OAB describes an assortment of symptoms such as the sudden, urgent need to urinate, seemingly endless bathroom visits and uncontrollable bladder leakage (incontinence). It can be very active at night leading sufferers to stumble and rush towards the bathroom, sometimes in the dark. In their haste, many people suffering from OAB fall. Considering the estimate that as many as 30% of men and 40% of women in the United States live with OAB symptoms, along with the fact that one out every three people over the age of 65 experiences a serious fall each year, and the combination is worrisome. In fact, the CDC classifies falls as a $34 billion public health problem that is largely preventable. At the 2015 American Urological Association Meeting, which took place May 15 – 19 in New Orleans, researchers from the University of Pennsylvania in Philadelphia presented data showing the correlation between OAB and an increased likelihood of falls. [i] They examined data from 32,587 people – average age 77.7 – diagnosed with OAB. After reviewing records over a three-year span, starting one year before each patient’s OAB diagnosis, they discovered a strong link between treatment for OAB and reduced rate of falls. People who had an OAB diagnosis had a higher risk (10.2 percent) of falling compared to those without an OAB diagnosis (5.3 percent). Incidences of chronic disease or conditions were higher among those with OAB than those without. Treatment for OAB reduced the fall risk compared to those who did not receive treatment. OAB diagnosis was associated with 40 percent increased risk of falling. One method for treating OAB involves percutaneous tibial nerve stimulation (PTNS) delivered by the Urgent PC Neuromodulation System. This effective, non-invasive, office-based treatment involves 12 initial sessions lasting 30 minutes each. Many patients start to see improvement after as few as six sessions and up to 80% respond by the end of the initial series. Urgent PC is one form of treatment that addresses the debilitating symptoms of OAB that often contribute to falls. According to the CDC, the death rates from falls among older men and women have risen sharply over the past decade and the World Health Organization (WHO) rates falls as the leading cause of accidental or unintentional injury deaths worldwide. Based on the results from the study that was presented during the 110th Annual Scientific Meeting of the American Urological Association (AUA), in May of 2015, there is a documented link between OAB and falls in older adults, making diagnosis and treatment of the condition increasingly important, especially for the older population. [i] Jayadevappa, R., Chhatre, S., Newman, D., Wein, A. (2015). Association between Overactive Bladder and risks of falls among Medicare elderly fee-for-service patients. Presented at the AUA Annual Meeting, New Orleans. Urgent PC is indicated for the treatment of Overactive Bladder and associated symptoms of urinary urgency, urinary frequency and urge incontinence. Treatment with Urgent PC is contraindicated for patients with pacemakers or implantable defibrillators, patients prone to excessive bleeding, patients with nerve damage that could impact either percutaneous tibial nerve or pelvic floor function or patients who are pregnant or planning to become pregnant during the duration of the treatment. Most patients don't experience side-effects. If side-effects occur, they are typically temporary and include mild pain and skin inflammation at or near the stimulation site. Caution: Federal law (USA) restricts this device to sale by or on the order of a physician. For complete instructions for use, storage, warnings, indications, contraindications, precautions, adverse reactions and disclaimer of warranties, please refer to the insert accompanying each product or online at www.cogentixmedical.com. Urgent PC is a registered trademark of Cogentix Medical © 2015 Cogentix Medical. All rights reserved. Rebecca Anderson has been a marketer in the healthcare industry for over fifteen years, the last ten of which have been focused on Urgent PC and other products from Cogentix Medical. Rebecca has a special fondness for Urgent PC, having been part of the Uroplasty team that launched the product to U.S. and International markets.